The holiday season is officially here and it's time to start working on your shopping list. While gift giving is awesome, it can also be quite stressful. To help you out, I've created a list of 15 useful and thoughtful gift ideas for yourself and other travel lovers in your life. All of these items are items I own and love or are high on my holiday wish list this year! Happy shopping! 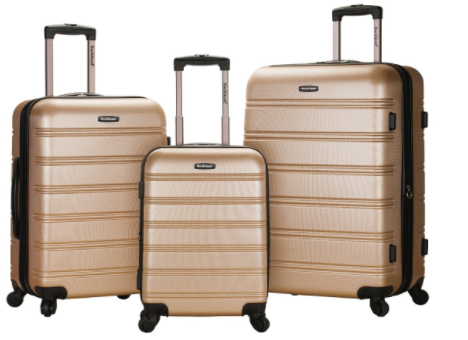 A solid luggage set is a must-have for any traveler. I absolutely love my Rockland Luggage Melbourne 3 piece set. It is affordable and high quality. I've used every piece at least twice, but the carry-on is what I use the most. It's survived trips to over 10 countries over the last three years and it's still standing strong! Purchase it here. If you read my article about how I packed over 45 items of clothing in my carry-on luggage, you already know that packing cubes are my "not-so-secret" ingredients. This is a necessity for keeping your luggage organized. Gone are the days where you have no clue where anything is in your luggage. Now you can have a cube for tops, bottoms, and anything else. I bought the Bagail 4-set packing cubes that comes with a laundry bag. Purchase it here. I wasn't always an expert packer. When I first started traveling I was a serial over-packer. My Camry Luggage scale was a life-saver on many occasions. This is one item any over-packer would greatly appreciate having. Purchase it here. This past year was filled with really long flights and road trips. Having a travel pillow during these long rides have been a saving grace. I'm planning on upgrading my current travel pillow to a Cabeau Evolution Memory Foam Travel Neck Pillow. I like that this pillow comes with a travel bag (you probably don't realize how often the pillow touches the ground and other germ-infested spots), it has earplugs (a nice added bonus), and it has raised side support and a flat back cushion which is excellent for neck pain. Purchase it here. Sleeping masks make great gifts for travelers, especially those that are sensitive sleepers. The Alaska Bear sleep mask is made of 100% silk on both sides! Great sleep during traveling awaits you! Purchase it here. A few years ago I took a trip to Thailand and Cambodia where my friends and I visited the most beautiful beaches and waterfalls. My friend had a waterproof phone case and it was awesome because she was able to bring her phone into the water with her with no issues and she captured great pictures. My Instagram feed was very thankful for her case. Naturally, after that trip I bought my own waterproof case. Purchase it here. Nowadays one USB port is never enough. Getting a multi-USB charger allows you to charge multiple devices at once. Also, it can be used as a great way to make a friend, because sometimes available charging posts at airports are hard to find. Purchase it here. I have an iPhone 6s with an "ok" battery life. My portable charger has been super handy when I'm out sight seeing for an extended period of time. The Anker Powercore mini is an high speed ultra compact charger. Mini chargers are amazing because they don't take up much space in your bag. Purchase it here. Polaroid cameras are a great way to instantly have a hard copy of a memory. If you make friends with the locals during a trip, you can gift them with a photo. There are many parts of the world where people won't be able to see the digital selfie you took together. The Fujifilm Instax Mini 8 Instant Film Camera is a fun way to make this happen. Purchase it here. The GoPro HERO is definitely something on my holiday wish list. I have a few friends who have this camera and they capture the most amazing photos and videos. The best part is that is it is easy to use, can be attached anywhere, and is wifi-enabled. Purchase it here. My travel journal comes along on all of my journeys. I like to use it to write down my experiences so I won't forget them. I personally use this Belle City Gifts' Travel journal. It's a functional size, has lined paper, and inspirational quotes on the front and back. Purchase it here. If you have been following my posts you know that using Air BnB has saved me a lot of money on accommodations during my travels. These days, It is quite common for people to stay in Air BnB rather than a hotel. Air BnB also offers gifts vouchers. Purchase it here. There has been so many times where I needed last minute items for a trip, but didn't have the time to go to the store. Amazon Prime is a gift that keeps giving. You can receive your shipments in 1-2 days! You can gift someone a 3-month or yearly membership. Purchase it here. Rosetta Stone is a perfect gift for someone who is interested in learning a language. One license provides you with access to up to 5 people. You can even make it into a group learning experience. Learning key phrases before you travel to a foreign country is always a good idea, but being able to fully converse in the native language is even better. Purchase it here. Lonely Planet's Ultimate Travel guide list their top 500 places to see. This is a great present for any wanderluster constantly planning their next move. Purchase it here. There you have it 15 gift ideas for the travel lover! Do you own any of these things? What's on your holiday wish-list? Disclaimer: This post contains affiliate links, which means I receive a small commission if you make a purchase through them, at no extra cost to you. This helps me keep this site up and running and bring you useful free content. Thanks so much for your support! Woman of faith. Encourager. Lover of cheap flight tickets and authentic travel experiences.